If you have a favorite charity or group (school, church or club) you’d like to support financially, a great fundraising idea is a group yard sale on a Saturday morning. I’ve coordinated at least four of them for different groups over the years – and like to call them Mega Yard Sales (see how much bigger and better that sounds right away?). These events netted up to $700 each, with a minimal amount of work. Community yard sales are a win-win situation for everyone. Money is generated by “renting” spaces to vendors (people in the community who sell their no-longer-needed treasures) for $10 or more. Vendors are happy because it’s a low price, they get to keep all the money they make from sales and they support a charity. Buyers are plentiful at these events because it’s more efficient for them to shop in one spot with lots of vendors than to drive all over town to individual yard sales. They’re happy because they have the opportunity to score incredible bargains and to indirectly support a charity. The charity gets the proceeds from the rental spaces, plus anything else you offer for sale. Bottles of water sell well, especially if the event is held in warm weather. Having water on hand also provides a service to vendors, keeping them comfortable during the event. Buy 24-packs of water on sale, chill them in a cooler of ice, and sell them for $1 each – and you can make $.80 or more per bottle profit. You can also sell donuts, cookies or other treats. You need a large space where the vendors can set up and where there’s plenty of parking for shoppers. I’ve held events at schools and in a large church parking lot, after getting the proper permissions. Mark off the individual vendor spots in advance and assign them to vendors who’ve prepaid; then make a master chart and direct vendors to their spots the morning of the event. Ask vendors to park their cars in the far corner of the parking lot after they unload their wares, leaving the closest parking spaces for shoppers. Advertise the event on online community calendars and on the local Craigslist (under garage sales and community events) every day for a month in advance. You can create a simple, free blog or website to include all the event details – cost, where to send the money, your contact info for people with questions, and a rain date in case of inclement weather. Stress that postponement info will be posted on the website to avoid lots of 5 a.m. phone calls the day of the sale if the weather is questionable! Include the URL for the website in all advertising. It’s a good idea to contact a local thrift store and ask them to have a truck on site at the end of the yard sale. Buy a box of large plastic trash bags and distribute them to sellers about a half hour before the end of the event, pointing out where to bring their donations and what time the truck will arrive. Sellers greatly appreciate not having to haul unsold items home – and like the idea that they can get a receipt from the thrift store for a tax deduction. If you plan to make the sale an annual event, keep the return address envelopes and emails from the initial event and contact everyone to participate again in subsequent years. The return rate for successful events is very high, and the whole process is much easier the second – and subsequent – times you hold it. Most of all, enjoy the event! Yard sale participants are usually extremely nice people. And take pride in the fact that your efforts will help a lot of people – buyers, sellers, and the charity you support. Saving Money: It’s Great: Why Do We Love it So Much? 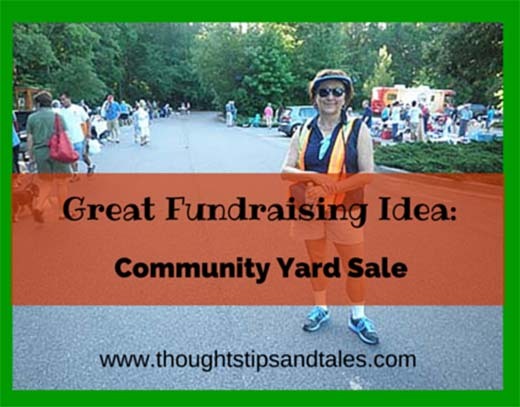 This entry was posted in charity events, community yard sale, fundraising ideas, life, miscellaneous, problemsolvers, saving money, yard sale and tagged community yard sales, fundraising ideas, raising money for charities, thoughts tips and tales, yard sales. Bookmark the permalink. Wow, there are som great ideas here, thanks for putting them together. I must use these ideas of fundraising. I really like this blog.